Researchers from IMDEA Nanociencia and other European centers have discovered that the combination of graphene with cobalt offers relevant properties in the field of magnetism. This breakthrough sets the stage for the development of new logic devices that can store large data amounts quickly and with reduced energy consumption. One of the latest technologies for digitally encoding information is spin orbitronics, which not only exploits the charge of the electron (electronics) and its spin (spintronics), but also the interaction of the spin with its orbital motion, offering a multitude of properties. A study by Brazilian physicist Aline Ramires with Jose Lado, a Spanish-born researcher at the Swiss Federal Institute of Technology (ETH Zurich), showed that a simple sheet of graphene has fascinating properties due to a quantum phenomenon in its electron structure called Dirac cones. 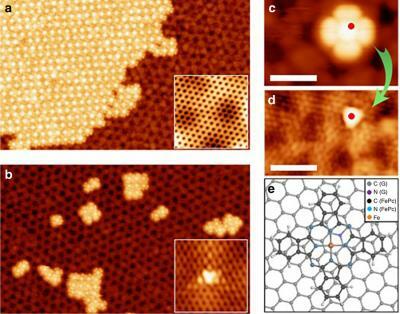 The system becomes even more interesting if it comprises two superimposed graphene sheets, and one is very slightly turned in its own plane so that the holes in the two carbon lattices no longer completely coincide. For specific angles of twist, the bilayer graphene system displays exotic properties such as superconductivity. The researchers found that the application of an electrical field to such a system produces an effect identical to that of an extremely intense magnetic field applied to two aligned graphene sheets. "I performed the analysis, and it was computationally verified by Lado," Ramires said. "It enables graphene's electronic properties to be controlled by means of electrical fields, generating artificial but effective magnetic fields with far greater magnitudes than those of the real magnetic fields that can be applied." Researchers from the Regional Center of Advanced Technologies and Materials (RCPTM) at Palacký University in the Czech Republic, together with the colleagues from the Institute of Physics (FZU) of the Czech Academy of Science (CAS) and the Institute of Organic Chemistry and Biochemistry (IOCB) of the CAS, have designed a new way to control the electronic and magnetic properties of molecules. Traditionally, such a change can be induced by application of external stimuli, such as light, temperature, pressure, and magnetic field. The Czech scientists have instead developed a way to use weak non-covalent interactions of molecules with the surface of chemically modified graphene. Scientists from St. Petersburg University and Tomsk University in Russia, along with teams at the Max Planck Institute in Germany and University of the Basque Country, Spain, have modified graphene in such a way that it has taken the properties of cobalt and gold: magnetism and spin–orbit interaction. This advance can greatly benefit quantum computers. The graphene was (for the first time, according to the researchers) modified to adopt such fundamental properties as magnetism and spin-orbit interaction. “The spin of an electron is a “magnet” induced by the spin of the electron around its axis. It also orbits the nucleus to produce electric current and therefore a magnetic field. The interaction between the “magnet” and magnetic field is a spin-orbit interaction. 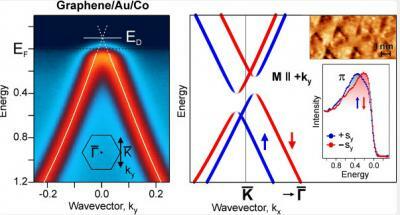 Unlike in gold, the spin-orbit interaction in graphene is extremely small. The interaction between graphene and gold increase spin-orbit interaction in graphene, while interaction between graphene and cobalt induces magnetism”, the team explained. Researchers from the Lawrence Berkeley National Laboratory discovered the world's first magnetic 2D material - chromium germanium telluride (CGT). It was debatable whether magnetism could survive in such thin materials - and this discovery could pave the way to extremely thin spintronics devices. The CGT flakes were produced using the scotch-tape method - the same one used to produce graphene for the first time in Manchester in 2004.